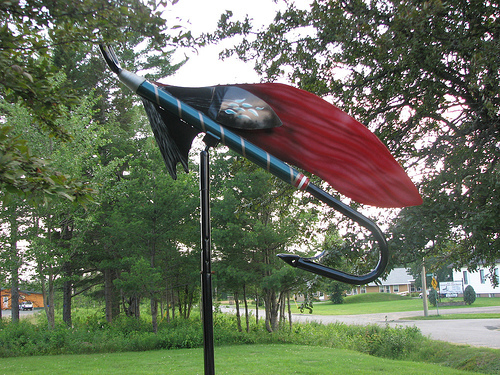 When I did research for a recent post and discovered that Komarno, Manitoba claims to be the mosquito capital of Canada and has a statue of a giant mosquito to promote its claim, I began wondering what other weird and wonderful ‘capitals’ there are in this country. 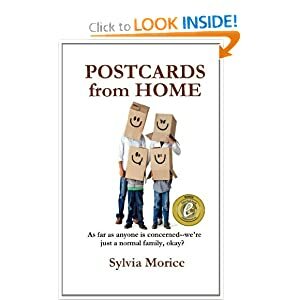 I was amazed to find that a wide variety of villages, towns and cities claim to hold a unique perspective on their place in the world, or at least on their place in Canada, including quite a few villages, towns and cities in my province of New Brunswick–what better place to begin? New Brunswick is a small province (population approximately 752,750), that borders Quebec, Nova Scotia, Maine (USA), and the Atlantic Ocean. We are a friendly people, the only ‘Official’ bilingual (English and French) province in Canada, and our history is shaped by our roots in the soil and our oars in the sea. So it seems prudent to begin this journey by mentioning the places I’ve found here that have statues commemorating their ties to earth and water. In an earlier post I wrote that Shediac, NB has the ‘World’s Largest Lobster’ , and I’ve decided that this is as good a town to start with as any. Shediac is a waterfront town of approximately 5,000 residents and is a popular tourist destination for its warm water beaches and laid-back lifestyle. It is also home to the “World’s Largest Lobster” which is 10 m (35 ft) in length and 5 m (16 ft) in height. I’ve seen this lobster and it IS huge. 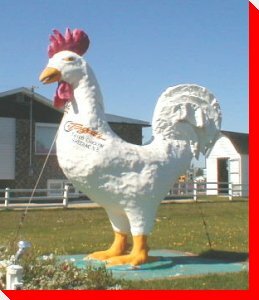 I haven’t yet seen the next statue that Shediac boasts about, but according to my research it is a very LARGE rooster! (I know a rooster doesn’t come from the sea, but I thought this statue, that is in front of Targett’s Fried Chicken, was worthy of a mention here anyway.) One drumstick would certainly fill me up. Caraquet is a small town (population approximately 4,150) in northern New Brunswick, and is home to the World’s Largest Conch. I’ve never eaten meat from a conch, but know that it is a food staple in many parts of the world. I have, however, put my ear to the conch shell to hear the ‘roar of the ocean’, and I’m sure that my son would love to own a conch musical instrument one day (apparently it is made by cutting a small hole in the spire of the shell and then is blown into like a trumpet). 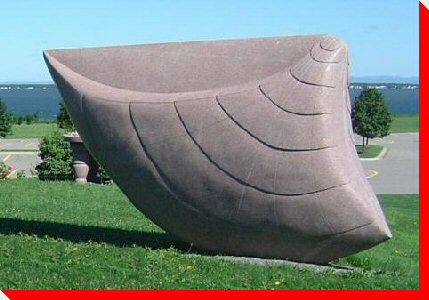 Caraquet is also home to a very large seashell. Staying in the north of the province we’ll head to Campbellton. 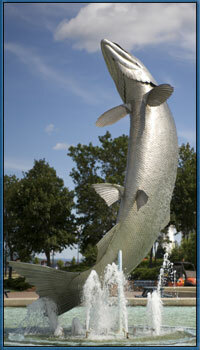 Campbellton is a small city, population approximately 7,400, that is also home to the World’s Largest Atlantic Salmon, (8.5 metres high), named Restigouche Sam. I enjoy salmon as a dish, either on the bar-b-q or baked in the oven with a sour cream and dill sauce, but I can’t imagine the size of the hook it would take to land this fish! 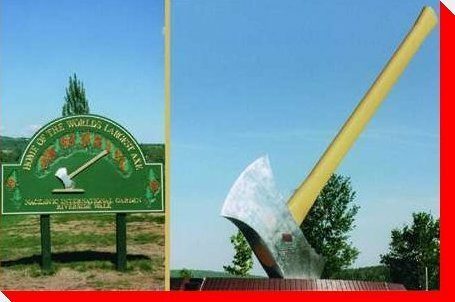 Perhaps the village of Blackville, NB (population 931), had Restigouche Sam in mind when it erected its giant Fish Hook . I imagine this size of hook should be able to handle a fish the size of Sam–but I wouldn’t want to be the person who had to clean the fish once it was caught! 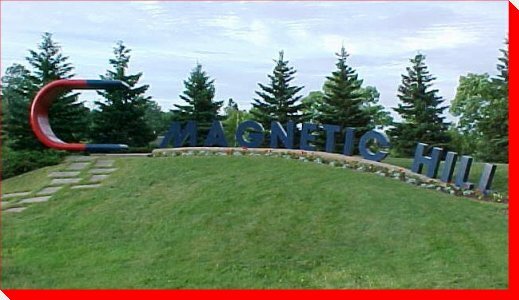 Maugerville (pronounced Majorville), population approximately 1,715, is located on the Saint John River, sixteen kilometers southeast of Fredericton (the capital city of NB). Maugerville is home to the World’s Largest Potato, one of New Brunswick’s treasured crops. Being a true New Brunswicker, I LOVE potatoes, in all shapes, sizes and methods they can be prepared. I like them boiled and mashed with butter and cream; I like them scalloped in the oven with onions and mushroom soup; I like them baked and split open to enjoy with butter, salt and pepper; and I like them cut into slices and deep-fried a golden brown, crispy on the outside yet tender on the inside. I have never met a potato I didn’t like. Maugerville’s potato is 6 m (19 ft) high and is made of ferro-cement. 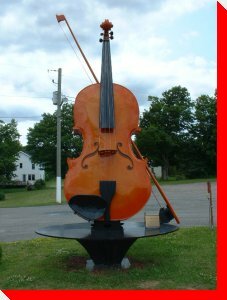 It was erected as a roadside stand for Harvey’s Vegetable Stand and has since become a NB roadside attraction. 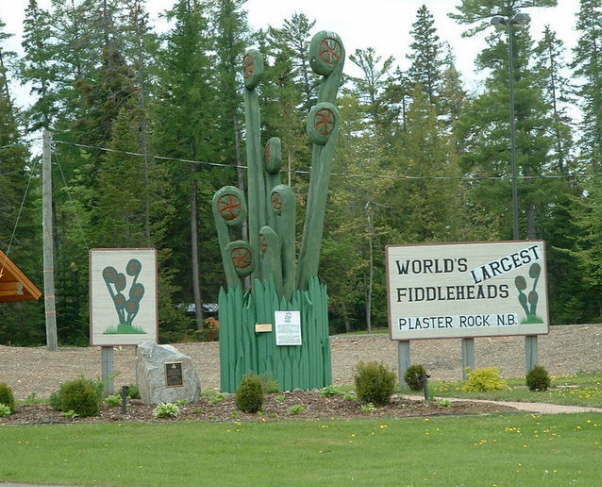 Plaster Rock (population 1,221) is located close to the Quebec/NB border. It is best known in Canada for hosting the Annual World Pond Hockey Championships. It is also home to the world’s largest Fiddlehead sculpture, built in 1995, a chainsaw wood carving that is 7.3 m (24 ft) high. Fiddleheads are a spring delicacy in eastern Canada, and these non-farmed vegetables are harvested by individuals in early spring. Fiddleheads can be enjoyed steamed with vinegar and butter, or in soups and chowders. Try them the next time you’re in NB in the spring of the year. New Brunswick is well-known for its abundance of maple trees. Every fall our forests dress in spectacular shades of oranges, reds and yellows and put on a show for residents and tourists alike. 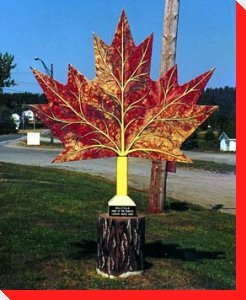 Fall maple leaves are gorgeous, but if you don’t want to wait that long to see one, perhaps you might take a drive to Millville, a small village in central NB that is home to the world’s largest maple leaf statue! What more is there to say? While we are treated to the show of gorgeous-coloured maple leaves in the fall of the year, in the early summer we enjoy a familiar favourite–juicy, sweet strawberries. I love strawberries (not as much as I love potatoes, but they’re up there…). Strawberries will soon make their appearance in local markets, and the U-Picks will open up within the next few weeks too, so it is a perfect time to enjoy this tasty fruit. I love to make strawberry freezer jam (quick and simple–perfect), and I enjoy strawberries sliced or crushed over vanilla ice-cream. Strawberry short cake is another Atlantic favourite dessert this time of the year, and it is delicious. And of course, is there anything better than biting into a freshly-hulled strawberry on a summer afternoon? 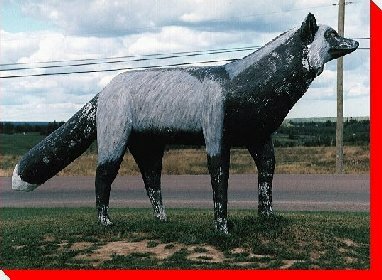 There are so many weird and wonderful statues in New Brunswick towns that I am sure I will miss at least a few of them, but I thought I’d end this post by including several more photos of unique statues and links to their towns/cities for you to check out on your own if you are so inclined. If you drive around the province you can also find a statue of a Blue Heron, a Bony Horse, a Moose, a Cow and Calf, a Lumberjack, a Fisherman, Nutcracker Soldiers and even Yogi Bear. But today’s last picture is of a large Semipalmated Sandpiper, a species of waders, or shorebirds, that flock to the Bay of Fundy shores for two weeks at the end of July and beginning of August, feasting on small invertebrates picked from the mud. I drove to Dorchester yesterday and looked at the statue myself, and a fine looking sandpiper it is indeed. Now I think I’ll go and eat the lobster I bought yesterday at the supermarket. I’ll just melt a bit of butter for dipping and grab a huge wad of paper towels (because I am a VERY messy lobster eater). A picture of that would not be pretty, so is best left unsnapped. Trust me. 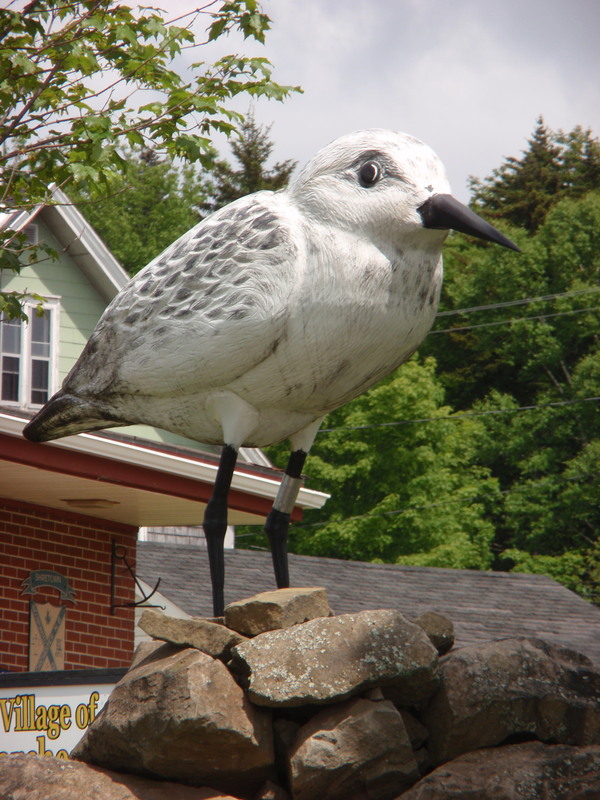 I din’t now that the is a lot of statues in NEW BRUNSWICK. You forgot the biggest blueberries. :o) Highest tides in the world. :o) Longest cover bridge. :o) The oldest shark fossil in the world. :o) All in New Brunswick! There’s no statue, but in the town of gueydon Louisana, where I grew up. would have been harder to defile? I’ve also always wanted to eat fiddleheads – especially after learning that if not prepared correctly, they can be toxic. Nice arm chair travel through New Brunswick. Hello from America. Hi to you, too…thanks for dropping by my blog. Thank you for a great gastronomical tour of NB! Being a Mainer I especially liked the giant lobster and the strawberry…almost time for strawberry pie! I wonder if strawberries with windows taste as sweet as regular ones? You’ve succeeded in making me want to come to NB…do you get a kick-back from the Tourism Bureau? Haha–I wish–maybe it would help pay for my retirement…but seriously, come to New Brunswick…you’ll love it here as much as I love traveling to Maine! 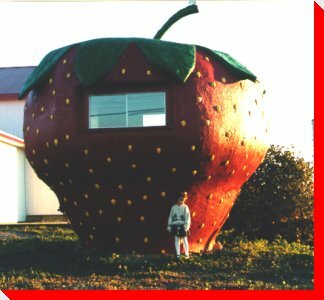 I also wondered about the ‘window on the strawberry’…wonder what we could see from inside? Thanks for this interesting and informative post. Very enjoyable. The sandpiper in Dorchester has a name. His name is Shep as in Shepody Bay near Dorchester. I knew a dog once named Shep. I wonder if the Sandpiper would come when you called him? Ah Here Shep – here boy. Nope doesn’t work. 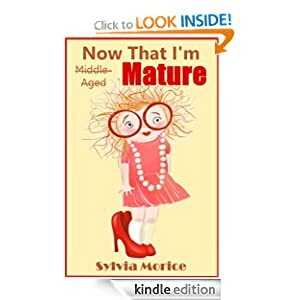 Nice read Sylvia. Thanks for the info, cousin! Somehow Shep just doens’t seem to suit the bird…maybe it’s time for a new name…like Piper or Sandy…hmm…will have to keep thinking. Oh, great you are in Canada? I am from Canada, I live in Toronto! Great blog by the way. I love reading your blogs! I love visiting Toronto, and thanks so much for reading my blog posts! Will pop over to yours in a sec. This is an amazing number of monuments for a small province. I’ll have to do some research to see what my province has! Some of the ones listed in Alberta seem not all that wonderful in comparison to the well known ones like the Pysynka in Vegreville, or the Dinosaur in Drumheller. I was guessing that you are from Alberta…I’m going there again this summer to visit my brother and sister-in-law…would love to see the Dinosaur and the Egg and the Spaceship my sister-in-law told me about in Vulcan, AB. They call it a vulcan spaceship – probably because of copyright or whatever – but check it out and judge for yourself. Looks like the Enterprise to me! …unless you are a trekkie!